Richard E. Byrd (DDG-23), a guided-missile destroyer, was laid down 12 April 1961 by Todd Shipbuilding Corp., Seattle, Wash.; launched 6 February 1962; sponsored by Mrs. Richard E. Byrd, whose daughter, Mrs. Robert G. Breyer, acted as proxy sponsor for the admiral's wife; and commissioned 7 March 1964, Comdr. Walter G. Lessman in command. Following a 45 day fitting out period at Puget Sound Naval Shipyard, Bremerton, Wash., Richard E. Byrd steamed for her homeport of Norfolk, Va., via the Panama Canal, arriving 14 June 1964. During July, August, and September she underwent missile qualifications and underway training out of San Juan and Guantanamo Bay. She then returned to Norfolk Naval Shipyard, Portsmouth, Va., for 2 months of post-shakedown availability. Richard E. Byrd deployed to the Mediterranean 6 January 1965 as a unit of Destroyer Division 182. Operating with the 6th Fleet, she participated in AAW and ASW exercises with both U.S. and NATO forces. Following her return to Norfolk 6 June, she conducted missile firings at the Atlantic Fleet Weapons Range. September, October and November found her on type training in the Virginia Capes operating areas. Steaming north to Argentia, Newfoundland, 7 January 1966, Richard E. Byrd conducted a missile firing test in the Davis Strait before returning to Norfolk a month later. Following firing exercises at Culebra in March, she called at the Virgin Islands before returning to homeport. Richard E. Byrd transited the Atlantic with Saratoga (CVA-60), Sampson (DDG-10), Dahlgren (DLG-12), and Cony (DD-508), entering the Mediterranean 29 March to commence a 5-month deployment. After turnover 2 August at Pollensa Bay, the Balearics, Richard E. Byrd steamed for Norfolk, arriving the 12th. Post deployment leave and upkeep occupied the next month. A call at Brooklyn Naval Shipyard (18 September to 7 October) was followed by local operations out of Norfolk with various amphibious and ASW fleet units. Operations of this sort continued into January 1967. Late that month Richard E. Byrd moved south to the Jacksonville operations area, and, while serving as rescue destroyer for Lexington (CVS-16), she rescued Lt. (jg) John F. Dickinson, whose A4-E aircraft crashed during a landing approach. After a 3-day call at Mayport and a visit to Mobile, Ala., for Mardi Gras festivities, Richard E. Byrd returned to Norfolk, where she remained until 3 March. "Springboard" exercises next took Richard E. Byrd to the Caribbean through 16 March, then came pre-deployment leave, upkeep, and training. Standing out of Thimble Shoals Channel 2 May in company with Saratoga and four other escorts, Richard E. Byrd steamed for the Mediterranean, effecting turnover 5 May at Pollensa Bay. Because of the Arab-Israeli conflict, port visits were curtailed. Instead of calling at Naples, Richard E. Byrd remained at sea in the screen of America (CVA-66). She was a member of the force which rendezvoused with the damaged Liberty (AGTR-5) 9 June. Returning to Norfolk 8 September, Richard E. Byrd entered the Norfolk Naval Shipyard for overhaul 21 November 1967 to 30 May 1968. Refresher training and coastal operations filled the summer of 1968, and on 11 September, the ship steamed to take part in NATO exercise "Silver Tower" in the North Atlantic and the Norwegian Sea. Back in Norfolk 11 October, Richard E. Byrd prepared for her fourth Mediterranean deployment. Joining the 6th Fleet 15 November, she immediately became involved in the varied evolutions that typify Mediterranean fleet operations. She returned to her homeport 27 May 1969. Local training, leave and upkeep followed, and then came a Caribbean cruise 29 July to 26 August. On 6 October ship and crew participated together with Senator Harry F. Byrd and Virginia Gov. Mills E. Godwin, in the dedication of Richard Evelyn Byrd Hall at the Virginia Institute of Marine Science at Gloucester Point, Va.
Richard E. Byrd continued local operations out of Norfolk during the first four months of 1970; she operated both along the east coast and in the Caribbean. On 30 April, she exited the Chesapeake Bay bound for her fifth deployment with the Sixth Fleet, arriving at Gibraltar 11 May. Six months later she was back in Norfolk and remained there for the rest of 1970. For eleven of the twelve months of 1971, she stayed in Atlantic coast - Caribbean Vicinity, undergoing overhaul, post-overhaul tests and refresher training. On 1 December she steamed out of Norfolk on still another Mediterranean cruise. She made Gibraltar 9 December and remained with the Sixth Fleet until 23 June 1972, when she began her return voyage to Virginia. She arrived at Norfolk on the 29th and continued normal operations out of that port up to 29 May 1973, when she again pointed her bow toward the Mediterranean She made Rota, Spain, 21 June and cruised the Mediterranean until November. Richard E. Byrd returned to Norfolk on the first day of December. 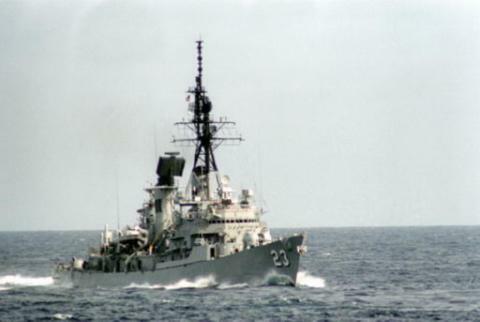 The guided-missile destroyer continued to serve until decommissioned on 27 April 1990. She was struck from the Navy list on 1 October 1992 and officially transferred to the Hellenic Navy on 26 August 1993. The hulk was towed to Salamis, Greece, on 12 October 1993 where she was used for spare parts for the other four Charles F. Adams destroyers in Greek service.